Astrobiology is still a young and growing science. For the first time, scientists and philosophers alike are able to chart the development of the field in real-time. 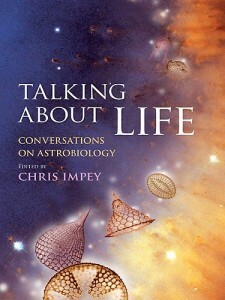 Chris Impey’s book, Talking about Life: Conversations on Astrobiology, takes a novel approach to this in seeking the views and professional opinions of scientists intimately associated with astrobiological theory and research, through relaxed and informal conversations. The book features 37 interviews from disparate personalities: from the current president of the Royal Society, Martin Rees, to prodigious science fiction writer Ben Bova. The interviews are each around ten pages long and are sparsely illustrated. They are divided into five principal sections: Introduction; Earth; Solar System; Exoplanets; and Frontiers – to address the major themes in modern astrobiological research. Each interview was prefaced by a detailed biography of the interviewee, much of which was then repeated in the course of the interview itself. A more concise summary of what each interviewee specialises in and the broad subject of their interview would have been a more informative introduction and would have made for a more enjoyable read. In this vein, while the idea of a more or less unedited conversation is a laudable one, often a lack of context or clear direction for the interview resulted in rambling themes that were difficult to follow. In general, the interviewees seemed to be well chosen for their broad sections, with a few more ‘famous’ names appearing amongst those who perhaps not all have heard of, but who can still offer fascinating perspectives in their particular fields. In some cases however, it was not clear why a particular interviewee had been chosen until some considerable way into their conversation, if at all. Again, some context or more transparent rationale for the selections would have been more helpful. Who is this book for? Astrobiology is a highly interdisciplinary subject and necessarily many of the high-profile interviewees are academics, and much of their conversations tend to become very intellectually involved. The average reader is unlikely to have encountered all of the concepts covered, and a suitable explanation was often lacking, leaving the initially uninformed still uninformed. It is clear, however, that extended explanations would have fundamentally changed the tone of the book away from a natural, academic conversation to a stilted pseudo-instructional lecture. Clearly, some compromises must be made. Chris Impey’s concept for the compilation of real-life conversations with astrobiological academics and professionals is unique and, at times, fascinating. He must be applauded for the evident effort in conducting and putting together nearly forty broad ranging interviews. In technicalities, however, the book falls down, and it is readability that suffers most. Perhaps it can be best utilised as a resource, capturing the opinions and ideas of major players in the field, at a critical time of the development of astrobiology, but it is certainly not light reading.